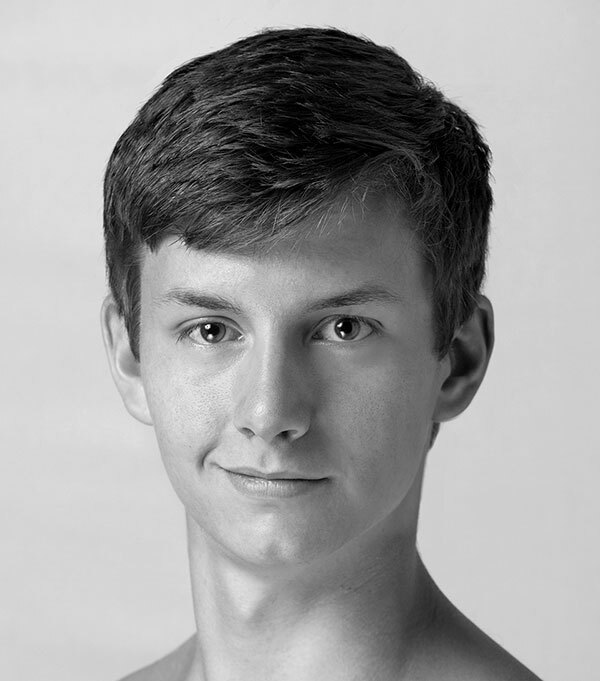 John-Paul Simoens has danced principal or featured roles in Tomasson’s Nutcracker (Jack-in-the-Box, King of the Mice, Spanish, Arabian, and Russian), Romeo & Juliet (Friar John), The Sleeping Beauty (Suitors), and Swan Lake (Aristocrats, Spanish, and Czardas); Caniparoli’s Ibsen’s House (Torvald Helmer in “A Doll’s House”); Millepied’s The Chairman Dances—Quartet for Two (principal in 2nd section); Robbins’ The Cage (2nd Intruder) and Fancy Free (Sailor); and Scarlett’s Fearful Symmetries (principal). He created corps de ballet roles in Marston’s Snowblind and Pita’s Björk Ballet. His repertory includes Balanchine’s Coppélia (Villagers, Dolls, Grooms, and War and Discord corps), Rubies, and Theme and Variations; Peck’s Rodeo: Four Dance Episodes; Possokhov’s Magrittomania and Swimmer; Robbins’ Opus 19/The Dreamer; Scarlett’s Frankenstein; Tomasson’s Caprice, Giselle, On a Theme of Paganini, and Prism; Tomasson/Possokhov’s Don Quixote (Seguidilla and Fandango); and Wheeldon’s Cinderella (Spanish Cavalier) and Rush. He performed in the 2015 film of Tomasson’s Romeo & Juliet (Friar John) in the inaugural season of Lincoln Center at the Movies: Great American Dance.